Sometime very soon, China will be launching three Taikonauts to their new space station, making them only the third country ever to accomplish such a feat. The station, Tiangong 1 (it means Heavenly Palace, which sounds like a place I have a take-out menu from) was launched back in late September of last year. If you were to compare it to the first space stations launched by the old Soviet Union and the US (which everyone will), it seems incredibly modest and small. But that would be doing the Chinese space program a disservice, since they don't really intend it to be a space station at all. They have a much better plan in mind— it's not really a secret, but it's also not the story given to most media right now. It's really a prototype of a cargo ship for a future, real space station. That may not be as exciting as saying it's an orbiting laser platform that tracks you by your iPhone device ID, but it's actually a really smart move on the Chinese Space Agency's part. The Chinese are taking a very slow and carefully measured approach to their space program; compared to America's (or Russia's) they're spending very little money. So they have to make each and every launch count. Space stations as a concept are well understood now— the hardest work has been done by the nine space stations that have preceded it since 1971 (for fun, here are the nine manned space stations: Salyuts 1, 3, 4, 5, 6, 7, Mir, Skylab (which was huge), and the ISS). This means the Chinese don't need to prove the concept, they need to just do it on their own. Even here they're standing on the shoulders of the Soviet program. Their manned spacecraft, Shenzou, is very much an improved, modernized Soyuz. Their future space station designs are based on the Salyut and Mir designs, though heavily modified and modernized. Tiangong, however, is different. It's not really based on the Salyut design, as a watcher of the Chinese space program would expect for their first station. It seems closer to a modified Shenzou. 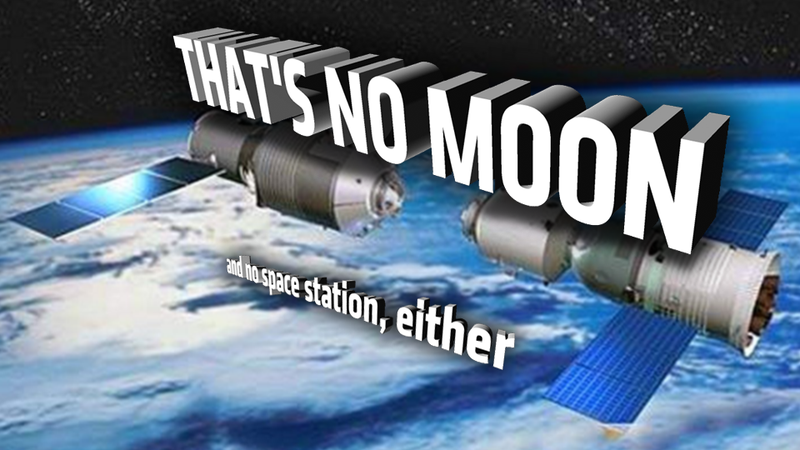 Even though I preemptively chastised hypothetical other journalists from comparing Tiangong to other early space stations, that's exactly what I'm going to do now. But I give myself special permission. Let's first look at it compared to the very first space station ever, Salyut 1 from way back in 1971. Salyut 1 was basically a 40,000 lb pressurized cylinder with a docking port and 3500 cubic feet of internal volume for living, experiments, and what I suspect was the first 0g masturbation (of a higher primate— I'm sure there was a reason there was no film of Ham the space chimp's flight). Tiangong 1, to compare, is a pressurized cylinder about 17,600 lbs and encloses about 508 cubic feet of habitable space. That's an awful lot less space for a crew of three to live and work in. And that's the first big clue this isn't a true space station. If the Chinese could launch a 500 cubic foot cylinder, they could launch a 1500 cubic foot one or more without too much trouble. There's a good reason it's as small as it is. China is even referring to it as a "Target Vehicle" and space geeks are more likely to think of it as a "man-tended station"— that is, it's a place you visit for a bit, not live in for long periods, like an actual space station. But all this is because it's a large cargo vehicle, not a small station. As the Soviets demonstrated with Salyut 6, the key to living in space for really long periods of time is to have a spaceship with two or more docking ports and robotic resupply craft to keep sending up food, fuel, water, air, nudie mags, experiments, equipment, etc. The robotic craft they developed, the Progress, was a huge success and is still in use today. This is the vehicle the Tiangong 1 should be compared to, and in this context it makes total sense. It has about twice the interior, cargo-haulin' volume, and possibly many other advantages as well. We just don't know the details yet, but based on the Shenzou compared to a Soyuz, it's likely. So, in a nutshell, here's what the Chinese are doing: they've outfitted what will become a future cargo vessel with a life support system and supplies, allowing their Shenzou crew to practice orbital docking, some limited space station living, test life support and propulsion systems for both future space stations and on their future station-supporting cargo ship all in one efficient mission. When they build Tiangong 2, they'll already have some experience and a resupply ship. It's pretty clever. I used to think the ISS partners should have just brought China on board as an ISS partner, but now that they're giving it a go on their own, I gotta admit, it's more interesting this way. A bit of friendly competition and some more spaceship variety is just more fun for us watching down here.